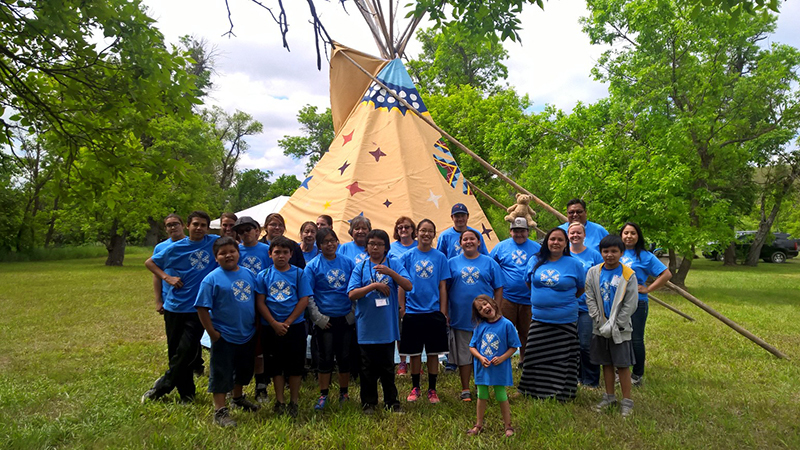 2nd Annual Lakota Language Camp comes to a successful end. It was a misty and rainy morning as camp staff, parents and students began checking in for the 2nd Annual Maȟpíya Lúta Owáyawa Lakȟól’iya Wičhóthi (Red Cloud Indian School Lakota Language Camp). 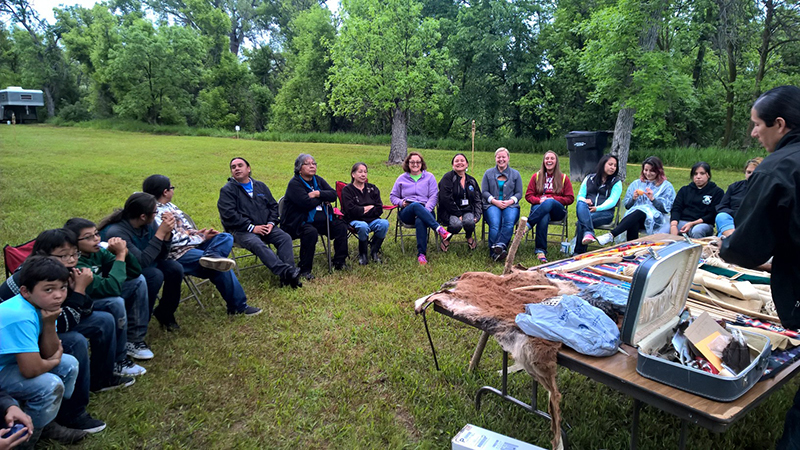 During the four-day camp Red Cloud Indian School students and alumni engaged in language-learning and cultural activities, and at various points became the teachers themselves. Many of the students who attended camp last year returned to participate and serve as mentors for the new campers. Participants were organized into three thiyóšpaye (family), with a moniker to carry with them throughout: waŋblí (eagle), matȟó (bear) and heȟáka (elk). Group activities included learning to harvest and eat traditional foods of the Lakȟota, cutting and drying meat, and lessons about the thípi, first building models and later constructing their own. One of the hallmarks of the camp was a new activity added this year: a haŋ wačhípi, or night dance. On the fourth night of camp the greater Pine Ridge community was invited to an evening of social dances, handgames and food. 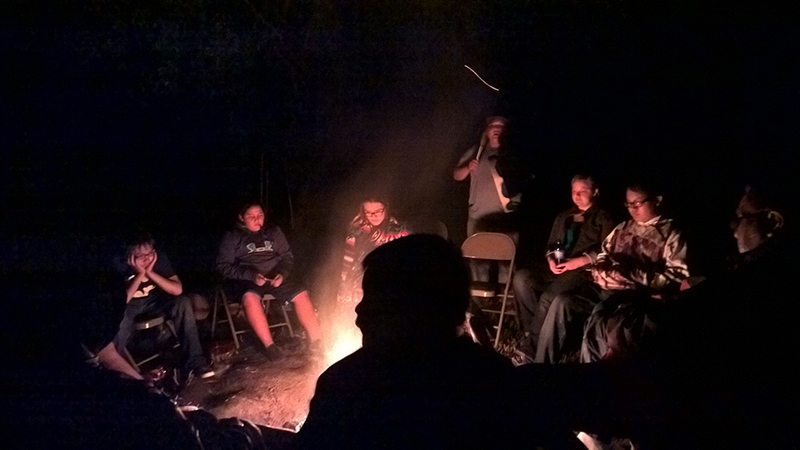 Camp staff and family members sat around the campfire as the sun hung low near the horizon, watching young campers teach Lakȟota games to one another, connecting across generations. We cannot thank enough our partners in this effort - your impact on our students, community and shared mission is invaluable. Our great thanks goes to the South Dakota Community Foundation, Grotto Foundation, Better Way Foundation and Endangered Language Fund. Plus Chante Etan LLC for the two tȟípi, the Intertribal Buffalo Council for the donated buffalo meat, and all the families and friends that donated water, snacks and immeasurable time! 2nd Annual Lakota Language Camp!